I painted the mismatched walls, and even painted the ceilings (plus the stairwell!) the same warm greige, to keep the old carpet from standing out in any way. Because “bright and airy” wasn’t on the menu, I aimed for “cute and cozy”. In this corner specifically, I removed the peeling wall paper (catch a glimpse in the right of the photo below or see here for more). A little textured paint hid the paneling lurking beneath. I tidied, cleaned, de-cluttered, and even gave some furniture away to make the space more liveable. 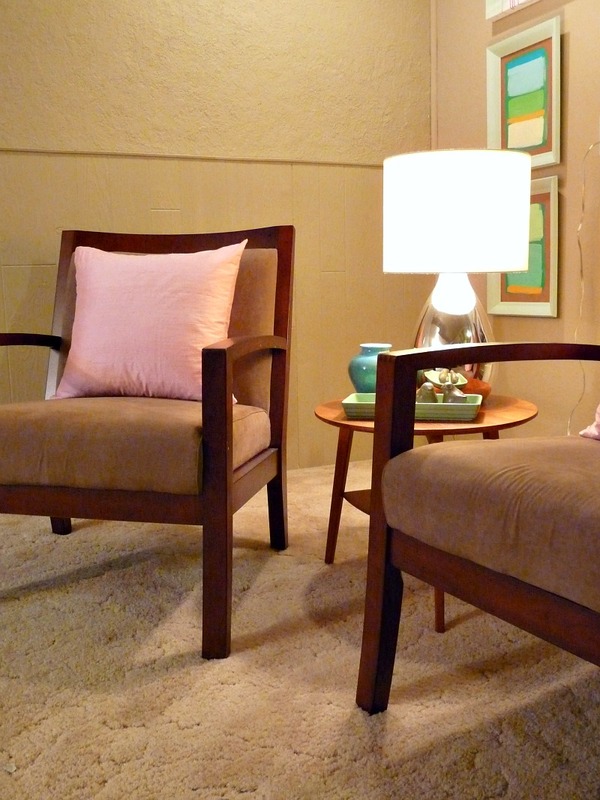 The chairs, teak table and lamp had been languishing in the basement after becoming obsolete upstairs. I tried my best to make this ragtag group of furniture look intentionally chosen for the space. Accessorizing and adding art in the same colour palette (pinks, turquoises, greens, black and white) helped the nook look planned. colour. The silk shines in the basement and lends such life to the room. 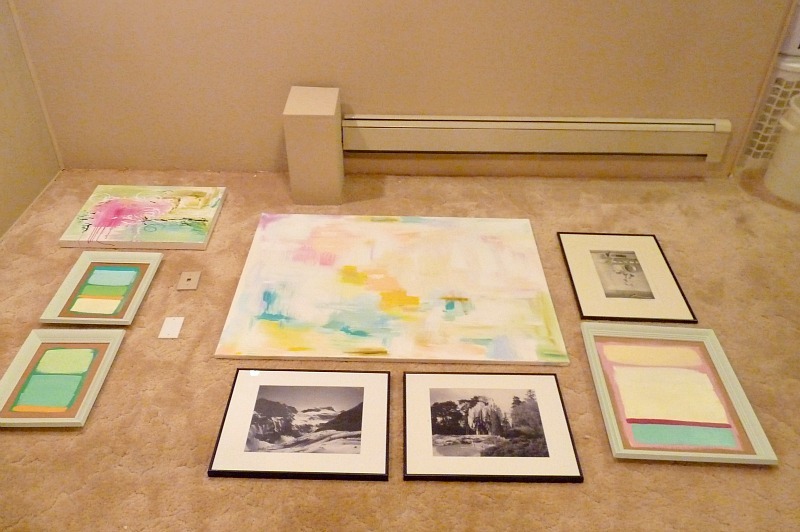 We laid everything on the floor and then hung it up. No newspaper cut outs like with the silhouette wall, because our options were a little limited. I would have liked something a bit “fuller” but the light switch and outlet are pretty high and pretty random and inhibited our art placement a bit. I also need to replace them with some paint-able covers. The Rothko-inspired art cost pennies. The other abstracts were DIY’s (see the making of one here). 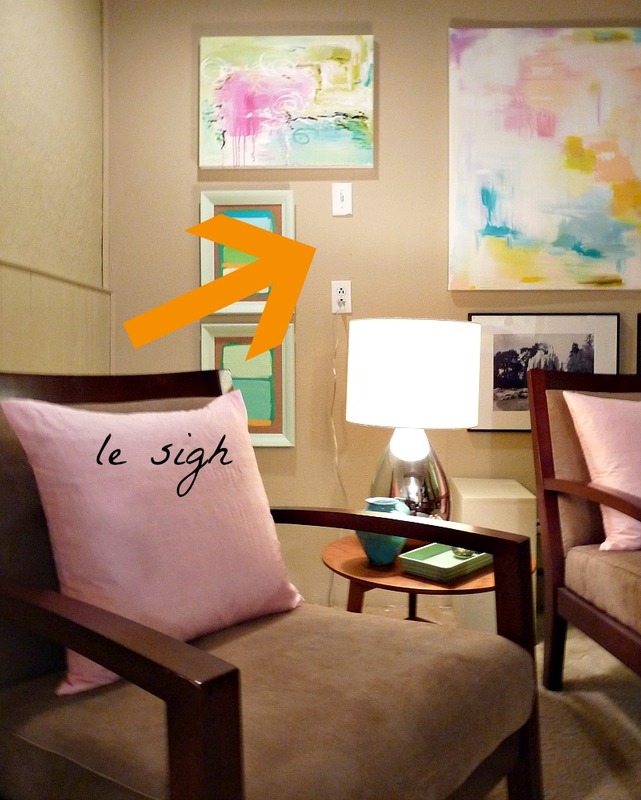 The etching above the larger cardboard painting was replaced with the DIY stenciled/antiqued mirror. I think I captured some of the feel of my inspiration photo. I just couldn’t stick to the pale aqua and pink – I tossed in some other colours via the artwork. The rest of the basement will be keeping with this feel (see more of the inspiration here). 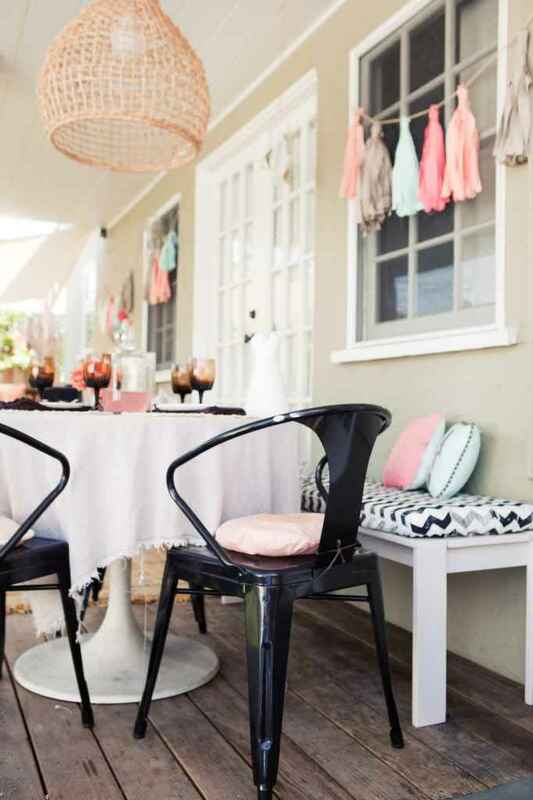 Greige with pops of black, white, pale pink and turquoise. If you remember, the stairwell has black and white and turquoise art, too. The turquoise chair and black chair will live here eventually. But first: a few more furniture makeovers, some more painting, a DIY curtain rod, some more art work, some sewing of curtains from you’ll never guess what, and more. We’ll get there. Looks great! 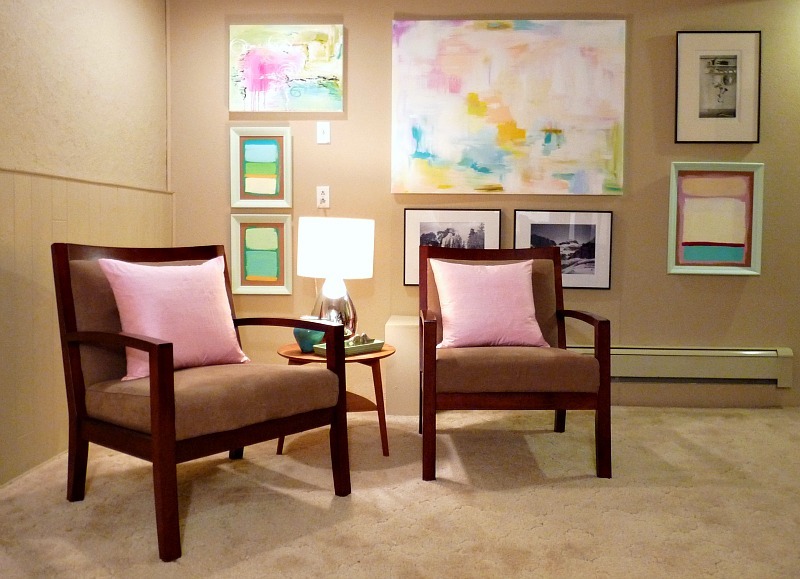 I love the light and airy color palette, perfect for a basement. Thanks!! The basement needed some life – I'm happy the palette reads as light and airy because that's exactly what I was going for. Looks SO good – really inspirational! 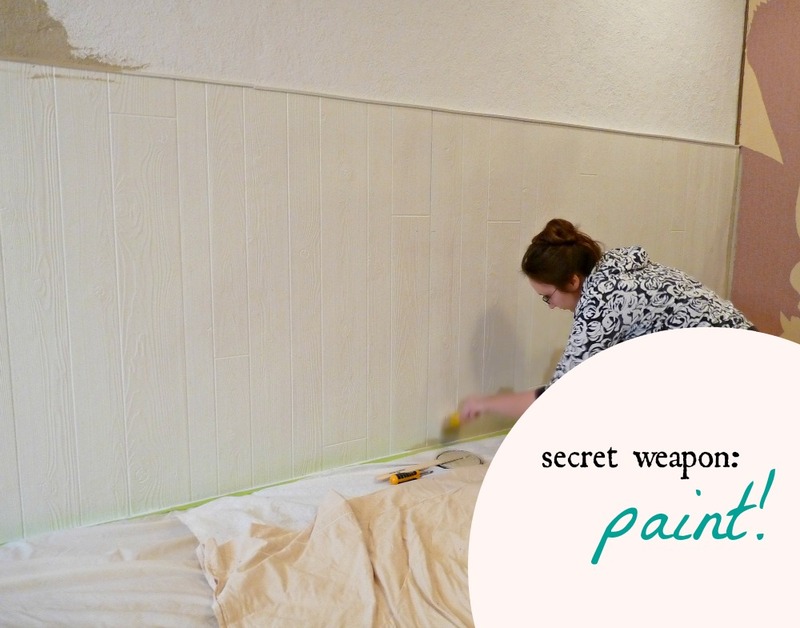 We have a couple ugly rooms in our house that need a quick and cheap makeover – been dreading taking down the wallpaper, but it makes such a difference with a little paint. Can't wait to see the rest! Quick and cheap, that's me! Haha. Oh yes, paint has made a world of difference down there, hiding mismatched walls and making what I thought was ratty carpet look much newer. Shall I bring my paint clothes when I visit? Wow! for a space with such a small window, this turned out lovely and feels light. I really like the soft colours- it is a surprising space for a basement- which in contrast can be dark, cool and hard with exposed concrete or rather utilitarian in design with berber carpet & furniture from the Brick. This looks intentional and styled rather than an afterthought.Lovely! Haha, my furniture is cheaper than Brick furniture: it was bought at the Superstore, lol. Yup, grocery store chairs from our first apartment. I'm glad it looks styled, because we had no money to really "decorate" – I've had to use leftovers. LOVE the new corner! Its very relaxed and adult friendly. 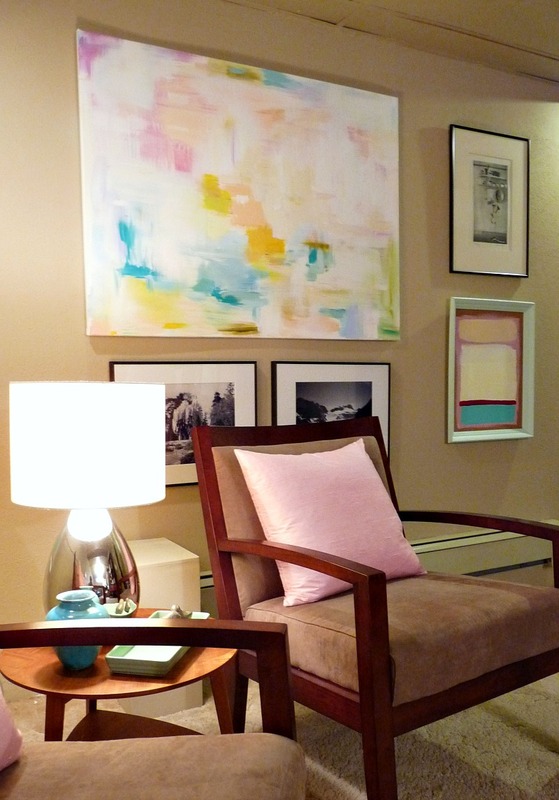 A place where you can just sit and hang out with a glass of wine, and enjoy the gallery wall. Oh yes, when the basement is totally done much wine will be in order. Much, much wine. I have to admit, when we bought the house I said I refused to hang out down there (centipedes) but now it looks cozy. And, frankly, the centipedes come upstairs, too, so really there's no hiding from them. I love it, Tanya! 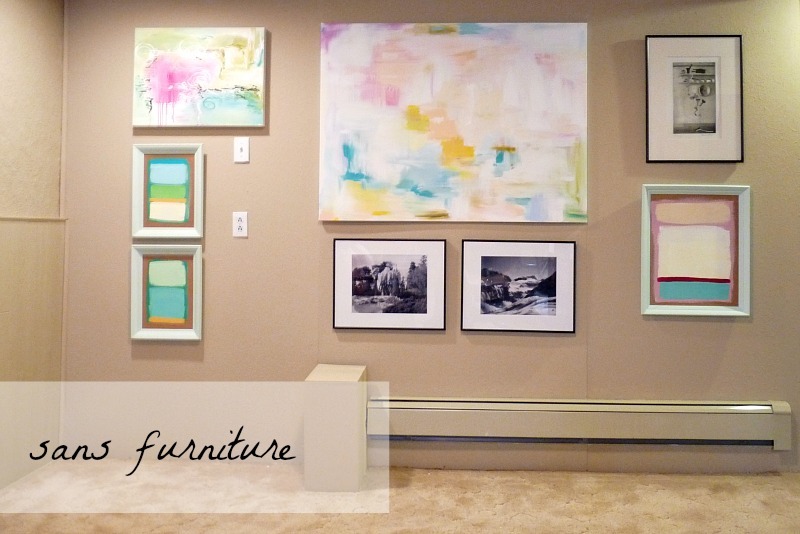 The wall of art looks great and I love the furniture you chose to fill the space. It does look cozy, like the perfect place for a cup of tea and a book, or maybe a long chat with a friend. Excellent work! Awww, thanks Jeanette! I can't wait to finish and share the rest of the space. There's a little art corner and craft area, too, which will be very inviting. Gorgeous color scheme and artwork. That inspiration photo is a stunner! Looks super cozy down there! Thanks Jane! The inspiration photo IS a stunner, I totally agree. I ended up with a bit brighter palette because it made the space a bit more cheery. I like more subdued colours with more natural light. WOW! That is so beautiful! I can't wait to see the finished basement. Thanks 😀 I promise to get to work again right away when I return to Canada. But maybe we can talk Hubby into chipping away at it while I'm in Hungary?? Looking good! It's really becoming a lovely, usable space. Are you designating a workspace so you can continue to use the basement for projects too? Thanks Dana! I thought you might like the taupey colour because you've incorporated so many more neutral colours into your gorgeous home. The opposite corner will have my easel and a work table and hopefully some organization so I feel free to work and don't feel the need to tidy first every time! This looks so good! I absolutely LOVE all of your art on the wall! Thanks!! I also think it makes such a difference between a dreary space and a lively space. I am going to eventually FILL this space with art (basically, to replace the non-existent windows). Not a fan of basements myself, I would even hang out down here! This looks fantastic!! You really did capture the essence of your inspiration room. Bravo! Awww, thanks! I am itching to work into the top left one a bit and it is SO frustrating I can't right now, lol. This corner is fabulous! 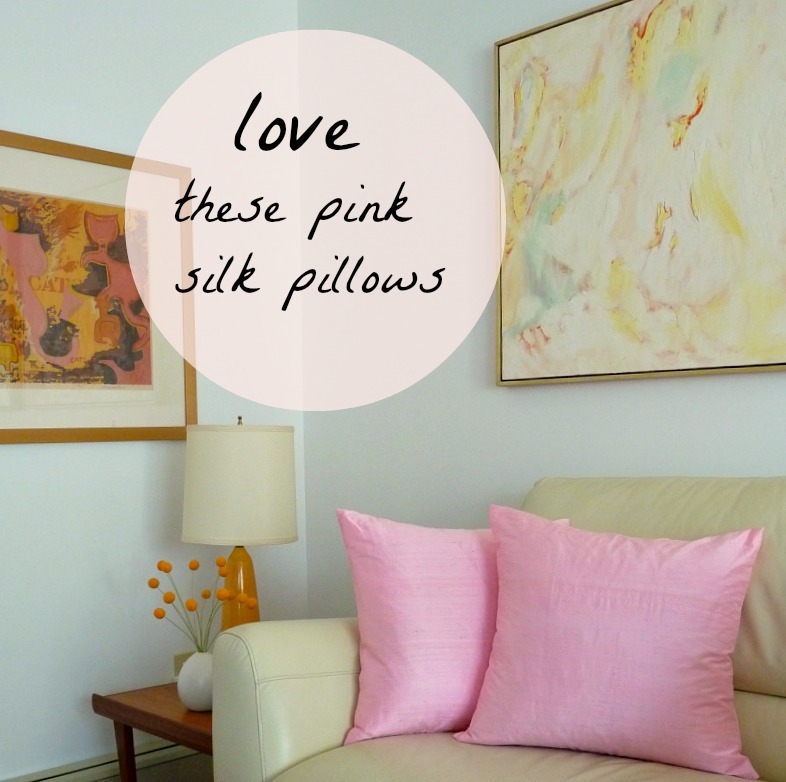 The pink pillows are yummy. The silk is so ancient – we've had it since I was a teenager. I originally wanted a long, tiered peasant type skirt and I'm so happy that idea fizzled because I am so, so, so much happier with the pillows. Plus there is more silk, for more pillows. And thus life is good. Wow, it looks great, Tanya! I love that you went with pink – it really works, and is such an unexpected surprise. Your cute and cozy is lovely! It is a bit like the colour theme of the play kitchen I made, remember? Right now I am on a beige and pale pink kick. It's been so fun to try something (the tiniest bit) different than the white+bright look I love upstairs. It's a twist on what is becoming "my" style. I'm so glad you like it, because you have such great style and expertise! I cannot tell you how inspiring this is! Our basement is less than ideal, with ugly acoustic tile ceilings and no windows, ugly carpet, etc., and we don't have the budget to completely overhaul it. You've made this little corner look extremely cozy and welcoming. Excellent work! Thanks so much for your comment. It's nice to hear from folks who have the same dilemmas as me! It has been really challenging working with the existing elements (ugly carpet, older drop ceiling, funny walls). 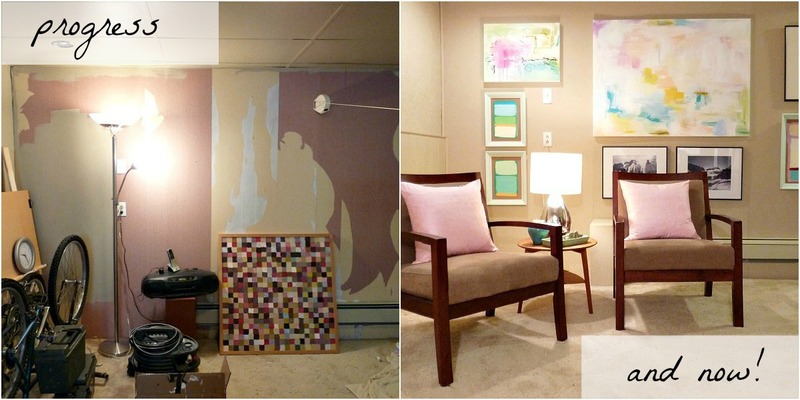 I am increasingly jealous of basement renovations that consist of just redoing everything. But I do what I can with our small budget. The trick was to use the beige paint (matched to the carpet, actually) to help everything blend in and fade away. I hope when it's all said and done, the whole space looks cute and cosy and less scary! I don't know how I missed this reveal. It's amazing what a difference some paint and you're awesome art makes! You're inspiring me to do some more work in our basement – we got started on freshening it up, but have put off finishing it for months. Now I'm actually excited to get down there! Awww thanks. Yay! Go basements!! I am hoping to actually finish it this year, seeing as last year I, well, didn't, lol.